This week, seven Grambling State University student entrepreneurs were rewarded more than $10,000 in support for their startups through the Golden Pitch Business Model Competition sponsored by BRF’s Entrepreneurial Accelerator Program (EAP). 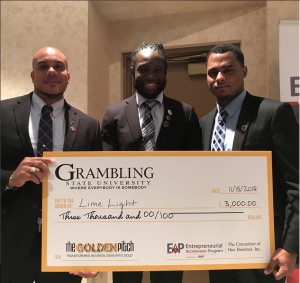 The Golden Pitch, one of three Louisiana university business plan competitions that make up the Grand Prix program, attracted 14 student teams from Grambling State University. Student entrepreneur teams received training and mentorship from local entrepreneurs, investors, and faculty members in hopes of winning one of three cash prizes, scholarships to Louisiana Startup Prize 2019 and the Patent Academy, and one year of business services from EAP. For more information on this year’s winning ideas or the Golden Pitch, please contact mediarelations@gram.edu or (318) 243-5012. This entry was posted in awards, campus, events, gramstory, studentlife on November 17, 2018 by Jovan Hackley.